Finally … weddingstories.ie is live! This is me, Documentary Wedding Photographer, David Gilmartin. My wedding photography is about telling the story of your wedding day through images (Wedding stories …). This is the final step in a process that started in July 2014. It should have taken a month or two at most. For many reasons, this site, the supporting design, images and data had to become a lower priority to more important things. I worked on it when I could and in the last couple of months, I had a lot of support from my son Odhran in getting it ready for public consumption. Thanks a million Odhran! This is also about building a wedding photography brand. My wedding images have always been primarily documentary or reportage in style. This is the main reason why wedding photography clients select me. It’s now time to be clear about how my documentary wedding photography tells a wedding story. A lot of thought and research has also gone into the documentary wedding photography options I offer clients. All of the standard options include full day coverage from preparations to the first few dances. All of the standard options also include a wedding album. Those of you who have followed my work at davidgilmartinphotography.com and on Facebook will see some familiar images here. In the next few days, I will have a separate Facebook page in place for weddingstories.ie. The existing website and Facebook page will continue and you will see some other photographic efforts appearing on both. 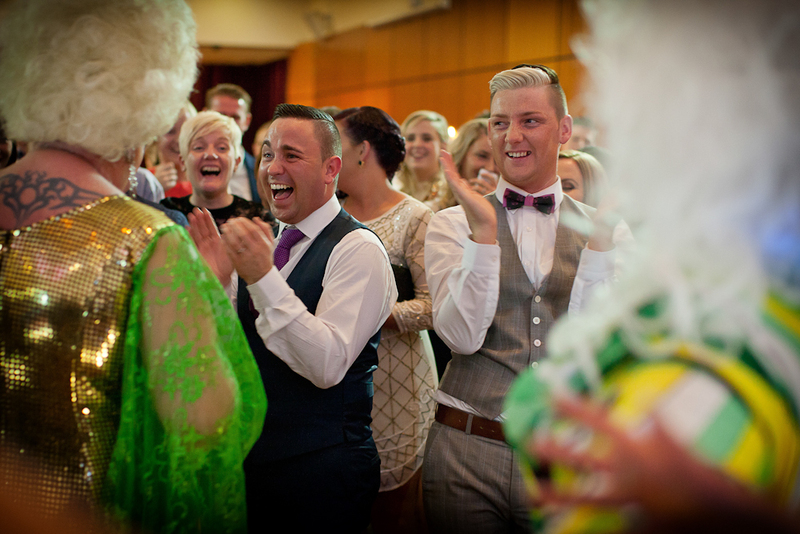 I have set up a Twitter account for weddingstories.ie (@wedstoryteller). If you use Twitter, please do follow me and keep up to date on the ramblings of your favourite Documentary Wedding Photographer. Above all, weddings are a time of celebration. I’ll finish up the first post on this blog with an image that’s all about celebration. Here are Jay and Andrew with their families and friends having a fantastic day.